By day, Erik Greenawalt is a CPA (the boring debits and credits type) working in corporate finance for a large Pittsburgh-based grocery chain. 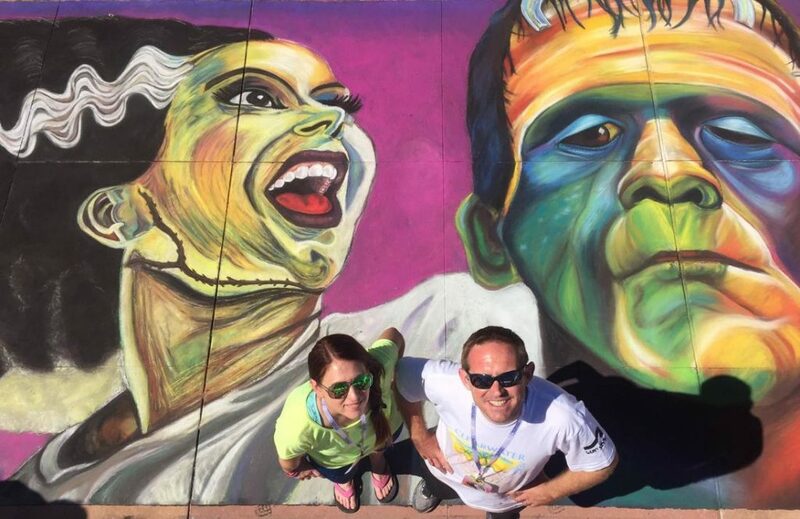 But on weekends, he puts on his other CPA hat – Chalk Pavement Artist – and adds life to driveways, streets, and sidewalks from Canada to Minnesota to Florida. Erik is a self-taught artist, having taken his last drawing class in ninth grade. His interest in chalk art began about a decade ago when doodling in the driveway with his then-toddlers, Jaycie and Jenna. He became known in the neighborhood as “The Chalking Dad” – and the name has stuck. Over time, those crude cartoon Disney princess stick figures have morphed into colorful portraits of pop icons and sports heroes, from Prince to Arnold Palmer to the Golden Girls. Often, Erik teams up with Lori Hughes as “The Chalk Monsters” together, they will be bringing their “A Game” to Chalktoberfest this year on one giant magical piece based on one little mouse.